This blog has been a ghost ship now for the past couple of months and although I’m not sure how many out there have actually noticed I feel I should apologize, for the radio silence and for neglecting my role as a fellow blogger alike. There’s been some things happening in my life that have diverted my attention and I have also had some truly productive bursts of creativity but for which this blog has not been a suitable platform. That brings me to the good news, namely that I have some major developments in the pipeline and 2016 might shape up to be somewhat of a milestone year for me. You will however probably not find much new content posted on this blog for some time still, but I will try and find my way back to regularly reading the blogs I follow as I have missed doing so. 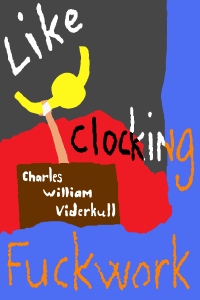 In the meantime I’m making my novella Like Clocking Fuckwork free to download from Smashwords. Use the coupon code YL59Z and you can download it free of charge in any ebook format of your choosing. Or, if you do not feel like bothering with the hassle of creating an account but would still like a copy, you can send me an email at cwviderkull@gmail.com, tell me which format you would like and I will send it to you. If anyone would like to get in touch with me for some other reason you can also always reach me at that address. And to inaugurate it I thought I’d have a bit of an old school giveaway of my novella Like Clocking Fuckwork (which you can find on Amazon here). If you would like a free copy, send me an email at cwviderkull (at) gmail (dot) com and tell me which format you would like it in and I’ll send it back to you. I’ll keep it open to the end of the week or as long as I feel like it.